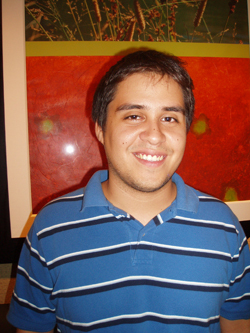 Daniel Fernandez, 2008 Collegiate Champ. 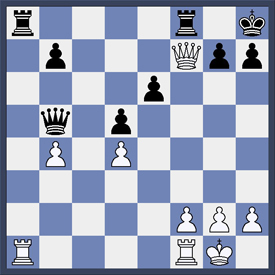 Nicholas Schoonmaker was Black in the following position, in which White just played Qxf7, which seems to exploit Black's weak back rank. Can you find his response? The final 4-0, Kalin Nonchev defended well against Lester Van Meter before getting the chance to execute his own attack. Meanwhile, Jeffrey Haskel drew top-seed Doug Root on board one. Daniel Fernandez dominated the first ever Collegiate Championship with 5.5/6, a full point ahead of the field. This is Daniel's second national title in less than a month--he won the U.S. Class Championship two weekends ago. Can he make it three? Daniel is registered for the five-day schedule of the U.S. Open , which begins tonight. Keep up to the minute on the U.S. Open by bookmarking the results and pairings page and watching live games on Monroi.com.